How hard is winter on honey bees and when it gets really cold, can bees die? Is there anything we can do to help our bees survive a harsh winter? Hi, this is David & Sheri Burns from Long Lane Honey Bee Farms and thank you for joining us today for another basic beekeeping lesson. In today's lesson, I will be addressing winter wrapping of hives, winter moisture in the hive and what we can do to help our bees survive the winter. Before we get into today's lesson, let me remind everyone to order your beekeeping equipment from us as soon as possible. You need to also place your package bee orders NOW! Order your package bees, queens and nucs from us immediately. If you wait until late winter or early spring, we cannot ensure that we can meet your needs. We'll do our best, but it pays to be ahead of the game! 217-427-2678 is our order line. Often I've said, "Bees can survive the cold..." and that is true, but I need to define that a bit more. A healthy full size colony, with an adequate supply of honey and a strong queen can survive a hard winter. Last night, here in Central Illinois, our low was nearly 20 degrees below zero! That's right -20 F.
At that temperature, very small clusters can not stay warm, especially since today's high is only 10. Bitterly cold and harsh conditions such as these will weed out your tiny little swarms you were hoping could make it through the winter. They just can't produce the heat they need to survive. A healthy, larger hive will have no trouble cranking up the heat because they have the numbers to do it. As I taught in my last lesson, winter survival is all about summer healthy hives, strong in number and ample supplies of pollen and stored honey. Does wrapping help. Certainly when the temperature gets way into the negative numbers, we all wish we would have wrapped our hives. Obviously, the bees do not have to work as hard if they are well insulated. However, as I've said before, this can increase moisture within the hive. Moisture in the hive is healthy to an extent. In other words, our queens will start laying a small amount of brood now, and they need that area to be high in humidity to keep the developing brood moist. But what we do not want to see is excessive moisture developing on the inner cover or top cover and freezing and becoming stalactites hanging down only to drip on the bees on the next warm day. While I do not believe wrapping is essential, I do believe we must make great efforts to remove the excessive moisture from within the hive, especially moisture that is the result of condensation at the top of the hive. 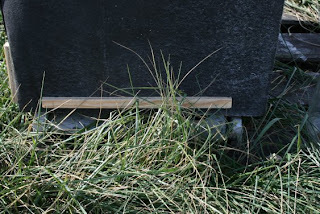 While I do not tightly wrap my hives, I have started placing wind blocks around the hives. I make a slightly larger box from scrap wood, panelling or black tar paper and slip this over a hive. There is a few inches between the box and the hive. A direct blast of frigid air cannot pound against the hive because it is blocked by the box. 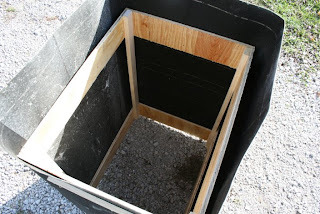 At the entrance, the box fits onto the bottom board so that the bees can still come and go. I do believe that wrapping a hive increases a hive's chances of surviving the winter, but only if extreme measures are taken to rid the hive of excessive moisture. If these measures are not taken, it is my opinion then, it is better not to wrap. Wrapping without providing a moisture escape means moisture will freeze above the cluster, then melt and drip down and kill the bees. In fact, since it was so cold yesterday, I was able to briefly pop a few tops off some of our typical hives that do not have our special insulated top cover. 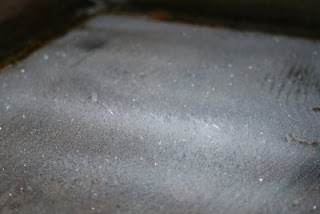 You can see in the picture how much moisture has collected and froze on the top cover in the picture. It is hard to see in the picture, but what you are looking at is the inside of a top cover upside down. All of the white substance is tiny stalactites, like frost standing up about 1/4 of an inch above the brood. In my last lesson, I presented how to make the top cover in order to avoid this kind of moisture build up. To me, I am amazed that beekeepers are keeping bees without taking these measures with the top cover. This is an absolute necessity for all northern beekeepers and the picture to the left shows what happens without an insulated top cover during the winter. We will replace this top cover with one of our insulated top covers before the weather gets above freezing. They are the producer of the THUM - Temperature Humidity USB Monitor. At the recommendation of the manufacturer I had to protect the sensor with a strip of screen to keep the bees from placing honey on the sensor. Here's a picture of my sensor with the modified screen protector. This device comes complete with the a USB cable and software. We have hives right outside our lab, so it was easy for the USB cable to reach between the hive and the laptop that monitors the hive. 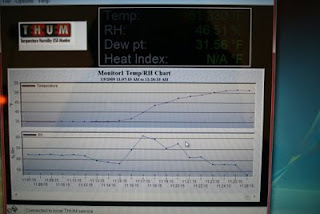 The monitoring software can be set to reflect an on screen graph tracking the humidity, temperature in the hive and the dew point. 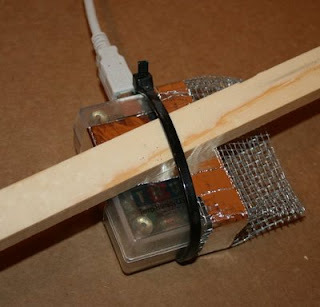 This device is probably not useful to the average beekeeper who is not conducting experiments unless you just want to have some fun and can let go of $130 bucks. In the picture below, you can see a screen shot of my the monitoring software at work. You can email the company for more information if you are interested, but be sure to tell them that I sent you their way. My wife and I have sat and wondered why beekeepers in the north are not more concerned about moisture/ice above the cluster. Perhaps they don't know and perhaps they believe the hive will not be weakened or killed by this dripping water. Sometimes the cluster can be to one side, and may dodge the dripping water. But there is a high probability that this dripping moisture will seriously weaken or kill a hive during he winter, especially those hives that are already weakened by other factors such as mites, a lack of pollen or honey etc. Finally, let me address how cold weather can kill a package of bees. Since we advocate that a large, healthy hive can survive the winter, most people assume a small package can survive the cold snaps which are common in the early spring. But this is not true, especially if the package is installed on undrawn comb. The smaller the colony the more difficult it is to stay warm during an extreme cold snap that last for several days. This is why we do not ship packages prior to mid to late April. A 3 lb package of bees equals around 10,000 bees. A healthy hive going into winter runs around 60,000 bees, which is a lot more heat and insulation. In The summer of 2011 we introduced our Winter-Bee-Kind after several years of studying overwintering hives. We could barely keep up with production they were in such demand. We still make them right here at Long Lane Honey Bee Farms but we've expanded our production methods to keep up with demand. So many beekeepers told us that these were the only thing that got their hives through the winter. This year, it's time for the 2014 production year. We even mix the sugar and pollen and right here and pour the candy into the Winter-Bee-Kinds. WHAT IS A WINTER-BEE-KIND? It is a one piece candy board that provides food, ventilation, upper insulation and an upper exit/entrance to help bees remain healthier during the winter. Someone said it insulates, ventilates and feed-i-lates. With the built in upper vent, you don't have to worry about snow covering up your hive's lower entrance. The bees can still go in and out through the top vent spacing. We avoid shipping Winter-Bee-Kinds in hot weather and start shipping each September-March. You can place our Winter-Bee-Kinds on your hive anytime, even in the winter. Because it goes on top of the hive in place of the inner cover, and you are NOT removing any frames, it can be placed on the hive in cold weather. Just do it fast. Open the top, remove the inner cover and place the candy side down and the vent slot toward the front of the hive and you're done. Click here to order your Winter-Bee-Kinds Some form of a candy board has been around for a long time. Beekeepers of long ago placed candy in their hives to provide enough food for their bees to survive the long months of winter. There are various mixtures and receipts for candy boards. Some are made with soft candy and some with hard candy. The end result is still the same. The bees will consume the sugar as they need it. We've always been concerned about the amount of condensation that can develop in the hive during the winter. The bees produce heat within their hive and as the temperature is very cold outside the hive, condensation will develop on the warm side, just above the bees on the inner cover or top cover. This condensation can accumulate and drop down onto the winter cluster of bees below. Bees can stay warm in the winter but they must remain dry. If this cold water drips down onto the bees, it can reduce their ability to keep their cluster warm. The insulation on our Winter-Bee-Kind helps reduce the excessive moisture and even puts some of that moisture to work, as it accumulates on the candy and makes it easy for the bees to consume the sugar. Thus, a Winter-Bee-Kind can help lessen two winter stresses, the lack of food and excessive moisture. We make our Winter-Bee-Kinds with sugar and a healthy amount of pollen powder. Many beekeepers make the mistake of only feeding their bees sugar in the winter, but the bees also need protein which they obtain from pollen. Our Winter-Bee-Kinds come with pollen mixed in with the sugar.. Click here to order your Winter-Bee-Kind today. We recommend that you place candy boards on your hive by December 22 (Winter Solstice). But anytime during the fall or winter is fine. Even if your bees run out of honey in February put a Winter-Bee-Kind on in February if you have too. In summary, winter wrap is not essential, but a wind block can help. An insulated top cover, or replacing your inner cover with some sort of insulation sheet will dramatically reduce the moisture build up within the hive. In our last lesson, I gave details on how to make an insulated top cover. If you do wrap, be sure and allow for the reduction of moisture build up. We'd love to hear from you! We enjoy answering your emails and phone calls. And, if you have a questions, feel free to call us and leave a message for our Studio Bee Live program. That number is: 217-427-2430. We'll answer your question on an upcoming program. I was wondering if a piece of Styrofoam could be cut to fit under the top would be suitable for insulation as well and not let the condensation drip down onto the bees? A cup of hot coffee don't sweat if placed in a Styrofoam cup. Just a thought.